Favorite Beer: Impossible question to answer - the one I'd offer is "The One In Front Of Me"! Favorite Beer Haunt: again, impossible to say - it's so contextual. My home when I cook dinner, a great beer bar like The Beer Mongers or Beerworks, a pub or restaurant when they have food to match the quality of the beer, and friends' homes to really celebrate life. What was the first craft brew you ever tried? What did you think? Well, I'm one to put all beer in the 'beer' category - the first one I most likely tasted with Miller Light growing up, after construction projects in hot weather. One of the first beers as an adult was Belt Brewings' (MT) Beltian White (which henceforth made me think that they were 'Beltian' whites, not realizing they were in fact 'Belgian' whites!). Do you Homebrew? If so, favorite Homebrew to date? No I don't homebrew - I'm an excellent cook of food! I do enjoy trying any beer available including of course homebrews by enthusiastic sharing homebrewers. How'd you hear about the PDXBeerGeeks? 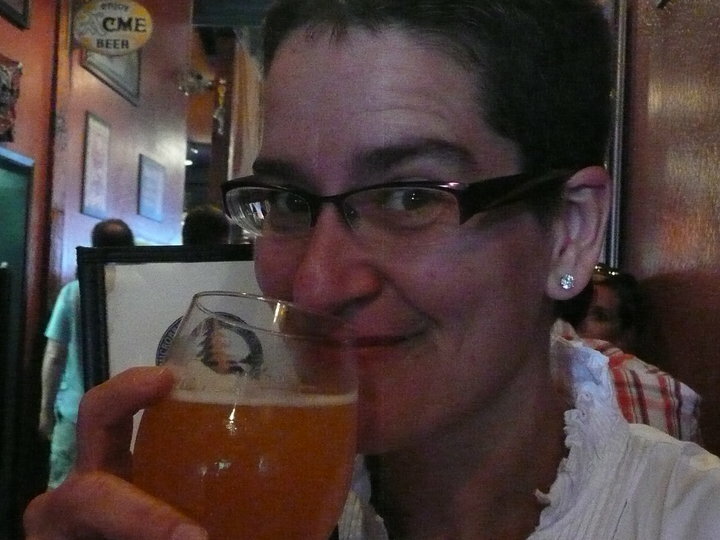 Welllllll, the fabulous Emily and I connected via twitter, and a beerific relationship has been brewing - one that I'm very grateful for. I met Michael at the world premier of the beer documentary, For The Love Of Beer - so lucky I am! What does being a beer geek mean to you? Being a geek - otherwise known as enthusiast (to me) is being open to all opinions, not judging, finding the positive, no arrogance allowed. Being open minded is contagious and fun - which is what beer and life should be. If you could change one thing about beer culture in the US, what would it be? That we'd shift culture for the better by shattering myths: verbage and menaings of outmoded words like "Dark" means "heavy" - let's not be beer racists, like 'domestic'; like women don't drink or enjoy beer - please! ; like some beers made don't merit our respect - ALL beers and breweries started small - we own them the benefit of the doubt that they are still made by good people who contribute much to our greater American community at large (think employment, supplies, vendors, growers, community involvement, and so on). AND the smaller brewers wouldn't be possible without the bigger brewers- they help push and fund technology development, safety, QAQC and research that the entire community (consumers and professionals) benefit from.